Last year the 9/11 fiasco canceled my trip to Europe to meet with Jim and Roselle. This year they again invited me to join them on their autumn teaching tour of Switzerland and Germany, and all went well. Together we flew from Honolulu to Germany, where I first took time to spend one week with my mother and family, while Roselle and Jim went on a cruise down the Danube to Vienna and back. We came together again in Augsburg, at Andrea’s home. 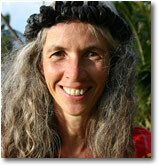 Andrea is the organizer for Roselle’s Hula-Retreats in Germany. She drove us the few hours down to Lake Konstanz (Bodensee) to the retreat-center called Wartensee just across the border in Switzerland, where Katharina (who organizes our Hula Seminars for Switzerland) greeted us. The next five days were spent with a group of old and new students, dancing, chanting, making leis and all the other hula activities. 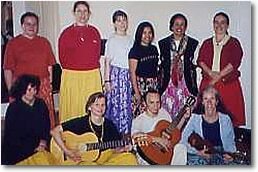 This was my first experience as a translator for Roselle, and as a teaching assistant. I enjoyed it very much, especially because our students were very helpful, alert and joyful. For the first two days the weather allowed us to practice outside in the cool autumn air. A group of neighborhood children watched and even joined with us for some of the movements. Also, to my great joy, my old friend and colleague Franziska, with whom I worked in Switzerland fifteen years ago, came to visit for an afternoon and watched us dance. The evening before the end of this retreat, our hula-sister Penny Prior and her Lomilomi students who just had finished their workshop nearby, came for a short visit, and we held a ‘Mini-Hoike’. What great fun, and everyone did beautifully! The day our retreat ended, Roselle, Jim, and I took the train with Christina, to her home in Switzerland near Bern. After a great Raclette dinner (a wonderful way to eat Swiss cheese), we took separate roads again the next morning. Jim and Roselle went to visit the Swiss Expo 2002 near Neuchatel, while I took the train for two days to see old friends in Solothurn whom I haven’t seen for over fifteen years. This was a wonderful reunion, as we had so much to tell each other. Time went by fast and soon I joined Roselle and Jim again, and we took the train up to Heidelberg. 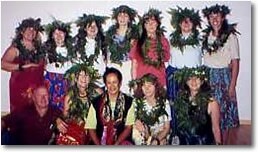 In the nearby town of Weinheim, Andrea had organized a public evening lecture about Hawaiian Culture. Some of Roselle’s German students were present, and the local guests as well as the students were captured by Roselle’s teachings. To test everyone right on the spot, Roselle invited the German students to dance Puamana. Everyone did well and enjoyed the evening. Afterward people came up and thanked us and said how fascinating it was and that our eyes were ‘sparkling’ while we spoke. The following day Andrea drove us north several hours to a retreat center called Haus Ebersberg near the city of Kassel, where I had the opportunity to get to know the German students, and dance and sing together. Some of the students brought their ukuleles and we learned during the next days how to play Puamana, Papalina and even Anapau. We enjoyed good vegetarian meals, a wonderful seminar-house, and each others company. Although it was quite cold (by Hawaiian standards) walks into the surrounding woodlands and meadows made this country retreat very special. At the retreat center, which is also used as a ‘Kurhaus’ (Recovery Center), we shared our meals in the same room as four older German people. They watched us practice outside once and enjoyed it. Because they had to leave the day before our retreat was over, we invited them to see our ‘Practice Hoike’. How happy we made them! This time we could see the sparkles in their eyes! The next day we finished our week-long study with a Hoike for our friends, family and guests. Everything went very well and I must compliment the German students for their dancing, singing and chanting, and how beautifully they introduced their Mele. Before we knew it, Roselle, Jim and I were off on the train again, this time to meet the students of Luana Na Manu I Hula Alapa`i, over to the east several hours, in Berlin. The day we arrived, Luana arranged an evening of dance, where some of the hula students performed dances such as Balinesian and Belly-Dance. Even a Tango was performed, followed by a short Hoike in which the students showed what they had learned the year before. Everyone knew their part well and enjoyed themselves. After this wonderful evening of good food and entertainment, we started our four-day Hula seminar, during which we all worked hard, learned a lot, and had a good time together. All too soon it was over, and we had to say good-bye. But before we left Berlin, we had a couple of days of sight-seeing, which I enjoyed very much. During this time Roselle, Olaf (Luana’s husband), and Jim helped me find the Berliner church under which my mother had been buried alive (and later rescued) during a bomb attach in 1943. This was quite exciting for me, and that evening I talked with my mother on the phone for a long time. Before our flight home from Frankfurt, we took the train back to Heidelberg and enjoyed two more days of sight-seeing. Thanks to Jim, Roselle and Kalyani, I had the opportunity to visit the Koenigsstuhl, the Heidelberg Schloss, and Thingstaette, all quite interesting. And thank you, Kalyani, for also taking us to Dillsberg, a most charming village along the Neckar-River. Thank you, Roselle and Jim, for taking me on this trip … and for the many experiences and impressions that filled me with awe and gratitude. The memories will stay with me for long time. I felt honored to translate Roselle’s insightful ideas and Hula guidance. Also, by assisting Roselle in the Hula workshops, I learned a great deal about teaching. The trip overall was a great success on all fronts!